My thanks to HW4672 for confirming that the Citybus Enviro500 is now available in Hong Kong, and also for providing a couple of photos, which have just been added (80896). You may like to take a look at HW4672's Photobucket site - well worth a visit! 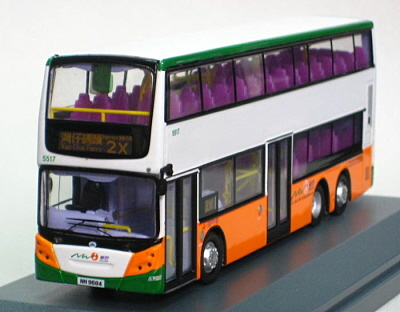 Please note the Citybus product code for this model is CM070. It also comes with a separate decal sheet. The release of the Kowloon Motor Bus Leyland Victory Mk2 from Drumwell (DW10901) is now expected in May. My thanks to Pan for sending me a selection of photographs of the new Kowloon Motor Bus Scania K310UD. Further photographs will be added to the section of the site shortly. 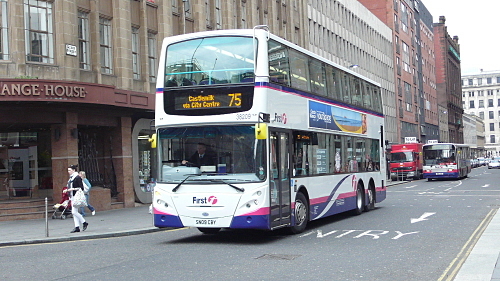 Thanks also to Andrew Shirley for sending a selection of photographs of the new Alexander Dennis Enviro500s which have just entered service with First Glasgow. Further photographs will be added to the section of the site shortly. Two new Enviro500 models have today been announced by 80M Bus Model Shop. 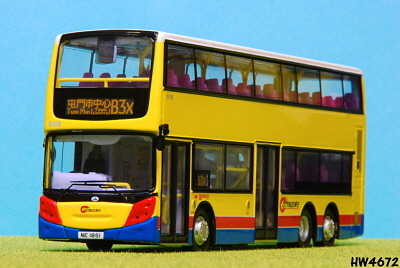 The first features Citybus 8108 (80896) on route B3X and is due for release on 30th April. 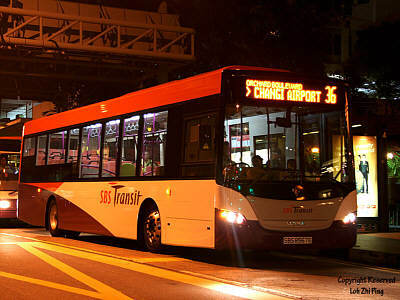 The second features New World First Bus 5517 (80897) on route 2X to Wan Chai Ferry, due for release in May. Both are limited to 1,500 pieces and will retail for HK$298. This is the first update since my computer crashed last week, and having acquired a new one at the weekend, I am trying to familiarise myself with Vista and several other new software programs that I have had to acquire as the old ones weren't compatible! My thanks again to Network Shuttle for advising of another 1/120 scale release from Best Choose. This time it features a new casting, a Kowloon Motor Bus Daimler Fleetline DMS type, fleet no. 2D38, on route 11B to Kwun Tong (06102). It is limited to 1,500 pieces and comes with a simple bus shelter. My thanks to Anthony Sham for providing the identities of the former Kowloon Motor Bus vehicles now operating for Brightbus in the UK. These have been added to the Brightbus page of the section of the site. My thanks to Network Shuttle for advising me of the release of the the above model, a Best Choose 1/120 scale China Motor Bus Leyland Victory Mk2 with CMB Hotline decals (05064). 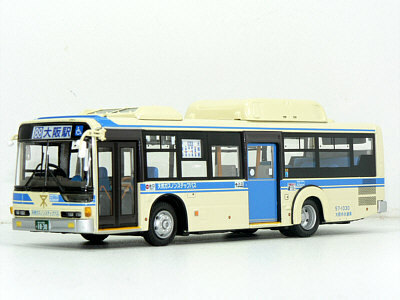 Another Hong Kong based model bus dealer has been added to the Links page. MSD has been in business since 2004 and are located in Shop 68, 1st Floor of the Apple Mall, 14 Kings Road, Tin Hau, Hong Kong. They specialise in buying and selling second hand bus models. 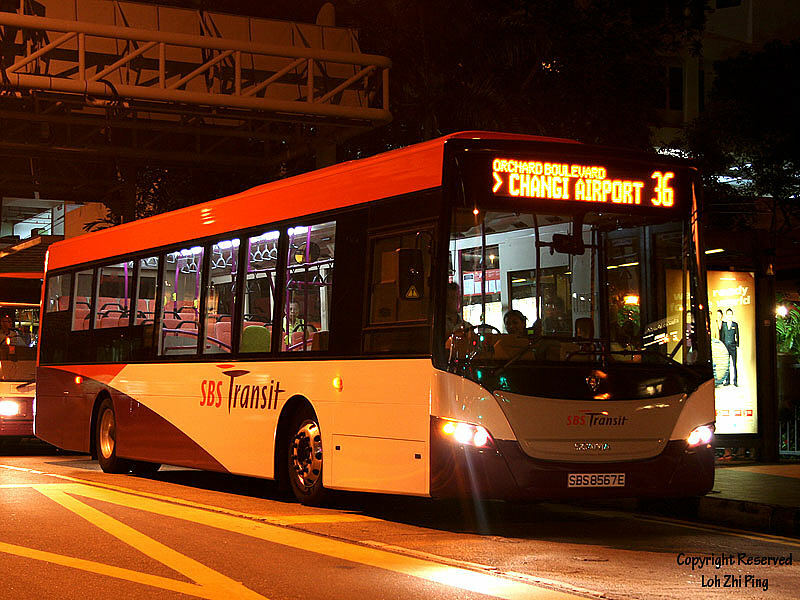 Photographs of the new Mercedes-Benz OC500LE in service with SMRT Buses, Singapore have tonight been added to the section of the site. 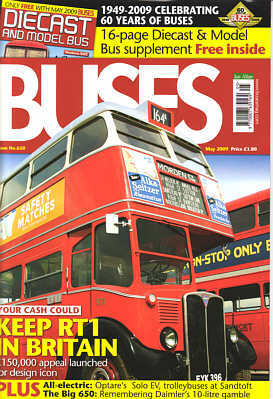 Buses magazine is also celebrating its 60th anniversary this year and the recently published May edition includes a 16-page Diecast & Model Bus supplement. Of particular interest to Hong Kong enthusiasts is a 3-page article by Andrew Gordon, entitled 'Far Eastern Promise'. A new page has tonight been added for the China Paint set featured in yesterday's News - just follow this link. 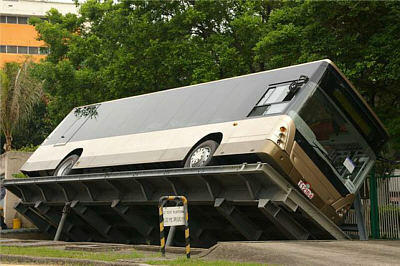 The above image is now featured on the 'Home' page to mark the 60th anniversary of double-deck buses in Hong Kong. Changes have also been made to the 'Home' and pages of the site, which hopefully will improve the page layout for those who view the site using a screen resolution size greater than 1024 x 768. Pictured above is set that never made it into final production. 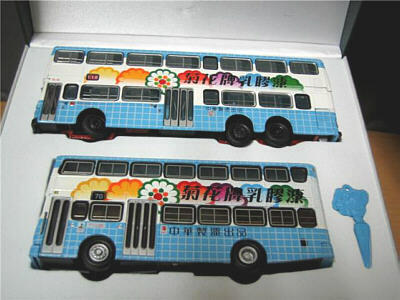 It was to have been issued by Expresso Wings for China Paint and featured ABC Model's MCW Metrobus, ML49 (000804) together with Collector's Model Leyland Victory Mk2 G439 (V207B). Further details will appear shortly. My thanks to Afiq Azman for sending me a selection of photographs of the new Mercedes Benz OC500LE in service with SMRT in Singapore. 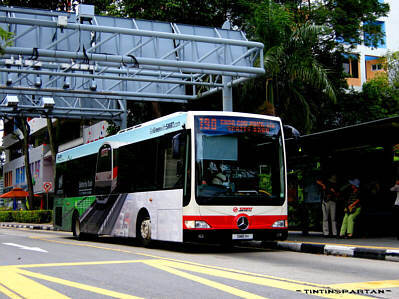 This model was first introduced into revenue service on 29th June 2008, on Service 190 from Chua Chu Kang to New Bridge Road, with only one unit for evaluation purposes. A further 4 units appeared on 23rd September 2008. Currently, only 67 (including prototype) are in active service plying a variety of routes. A further 66 units are expected to be put into revenue service by mid-year. Further photographs will be added to the section of the site shortly. 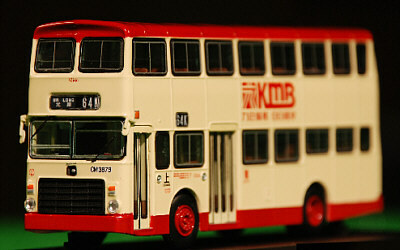 The above photograph shows a pre-production model of Drumwell's new KMB Leyland Victory Mk2 (DW10901). The 80M Bus Model Shop has organised a bus tour with The Big Bus Company. Further details can be found here . Tickets are apparently on sale at Mong Kok until 15th April. Only 44 tickets are available. My thanks to Loh Zhi Ping for sending me the above photograph and advising that SBS Transit has begun to introduce new Scania K230 Euro 5s into service last week. The new Euro 5s are part of the additional order being placed with Scania. 400 units of the K230 Euro V has been placed. Currently they are all serving routes 36 and 3. I have tonight added a new page for the pre-production Citybus Leyland Victory Mk2 in 'Ocean Park' livery, just follow this link. 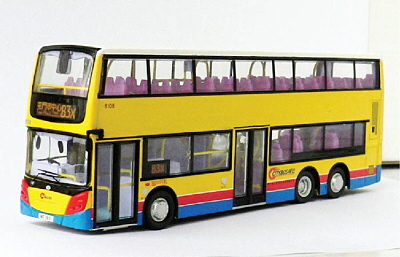 Continuing the pre-production models theme, and as detailed on 30th March, a new page has tonight been added for a pre-production example of the Citybus 'Year of the Rooster' Dennis Trident with Alexander ALX500 bodywork - just follow this link. 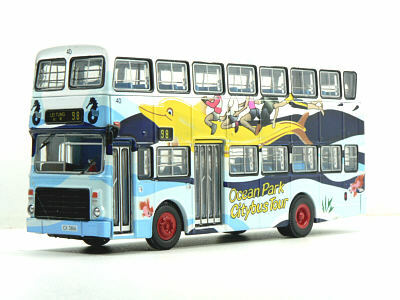 The next pre-production model to be featured shortly is this Citybus 'Ocean Park' liveried Leyland Victory Mk2, pictured above. My thanks to Keith Wood, who, following the recent new page featuring the pre-production sample of the red and white Airbus liveried Volvo Olympian, sent me a photograph of the actual vehicle. Keith has also provided a photograph of New World First Bus Enviro500 fleet no. 5502, as modelled by 80M Bus Model Shop (80895). He has also been updating his three Fotopic sites,. Following the news item on 29th March regarding a pre-production model of the New World First Bus Volvo Olympian (43211), a new page has tonight been added. This appears in the 'Rare Models' section of the site, which can be found under the 'Other Items' menu bar. A new section detailing pre-production models has, at long last, been added, although further work is required. My thanks to Neo Mak for sending me some photographs of showing one of KMB's new 12 metre Scania K230UB with Caetano bodywork undergoing a tilt-test. Further photographs have been added to the section of the site. Creative Master Northcord Limited has proudly released another brand new non-ukbus series replica. It is JB1012, a Mitsubishi Fuso MP Non-Step model carrying Osaka City Bus colours. 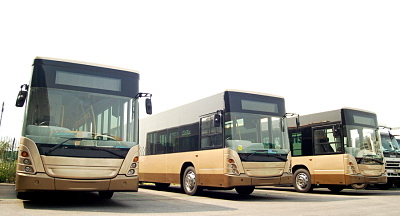 Osaka City Bus operates a large fleet of vehicles in the biggest city of Kansai area. The latest state of art vehicles in the fleet are these environmentally friendly buses with the CNG tank on the roof. JB1012 features such a vehicle with an additional brand new air-conditioner as well. JB1012 features a piece of standard equipment that is fitted onto all Osaka city buses. This is an additional, protruding wheel arch that is fitted over the standard rear wheel arch but only on the nearside, where it is located immediately to the rear of the centre door. Such a safety wheel arch is not popular in other Japanese cities but it is a common sight on the buses that work the streets of Osaka. The replica captures this significant feature. JB1012 features excellent detailing, inside and out, including an opening engine door and engine detail. JB1012 is based on a one-piece casting whose clean lines accentuate the windows and livery application on which all logos and lettering are clearly legible respectively. The model has no ugly metal poles to hold it together. The JB1012 model is limited to 200 pieces for the UK, Australia, P.R. of China and Hong Kong. They will be distributed by John Ayrey Die-Casts Limited (UK), Transit Graphics (Australia), cnmycar.com (P. R. China) and Concorde Hobby Shop (HK) respectively. 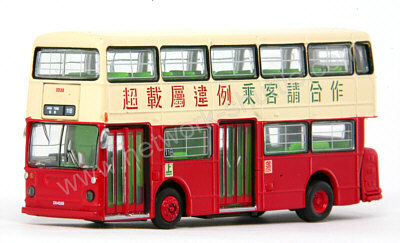 The Hong Kong Model Co. website advises that their resin KMB Seddon Pennine 4 (8175A) has now been released. The model represents AR7615, which was converted to a coach in 1975 and is easily recognised by its AEC style radiator grille. It is on route 35A to Shek Yam. To assist in updating the site, I would be grateful to receive any fleet numbers, registration numbers, route numbers or destinations for the latest batch of 1/150 scale Kowloon Motor Bus models from Cars Workshop - please e-mail me. 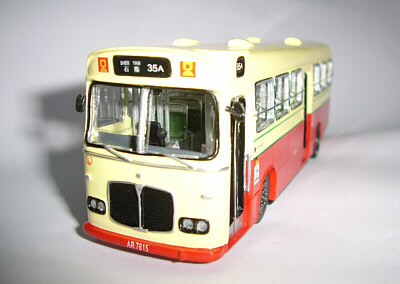 A new page has tonight been added for the Kowloon Motor Bus Daimler 'A' from Cars Workshop (38206). A new page has also been added for the Kowloon Motor Bus Leyland Victory Mk2 (DW10901). I have been advised that the quantity for this model is now 2,000 pieces, and not 1,800 as reported yesterday.